A golf caddy resume like other resumes begin with furnishing the contact details of the applicant then a crisp objective that at once can draw the attention of the recruiter followed by a job summary i.e., skills, abilities, experience in accordance with the job posting, then comes the education section in which the applicant mention about the degree, license and the certifications. Now we provide this standardized Golf Caddy Resume Format template with text and formatting to help you finish your document faster. If time or quality is of the essence, this ready-made template can help you to save time and to focus on what really matters! Get free resume templates! 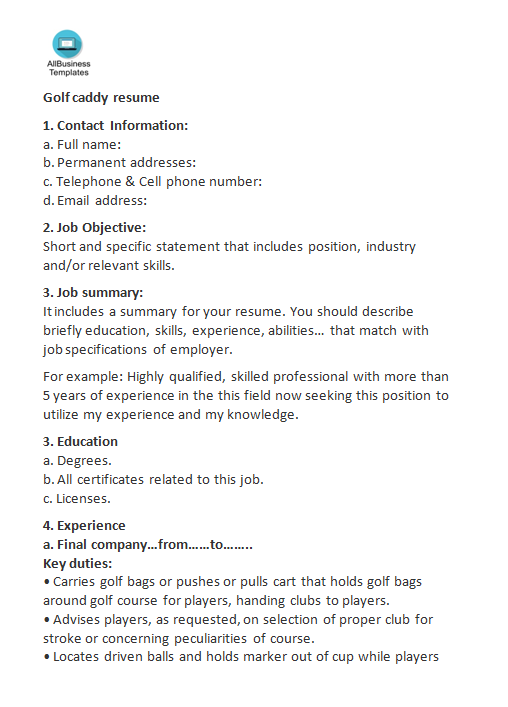 Download our free Golf Caddy Resume Format template now! This template will perfectly suit your needs!